Unfortunately there were technical problems with my plane, which meant no in-flight wifi, and no in-seat power. Given that my flight was during the day, that was a serious drag on my productivity, but I did get an appreciation card from the flight attendant as compensation. I had Platinum status at that time, but decided to wait a little while until I made 1K, just to see if the compensation offer might be better. Judging from the offer I received when entering my details at united.com/appreciation, I think I made the right call. 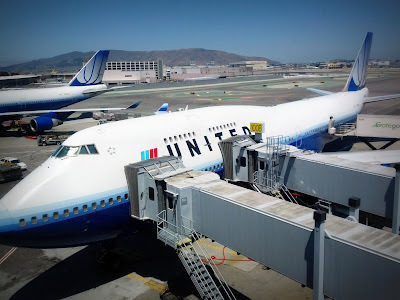 For my troubles, I received a choice of 9000 redeemable miles, a $200 United travel certificate (good for domestic travel), or a 10% discount on a future United flight. I was tempted by the miles, but ended up choosing the travel certificate. Despite the somewhat off-putting pre-molded shapes, breakfast was actually reasonably tasty. 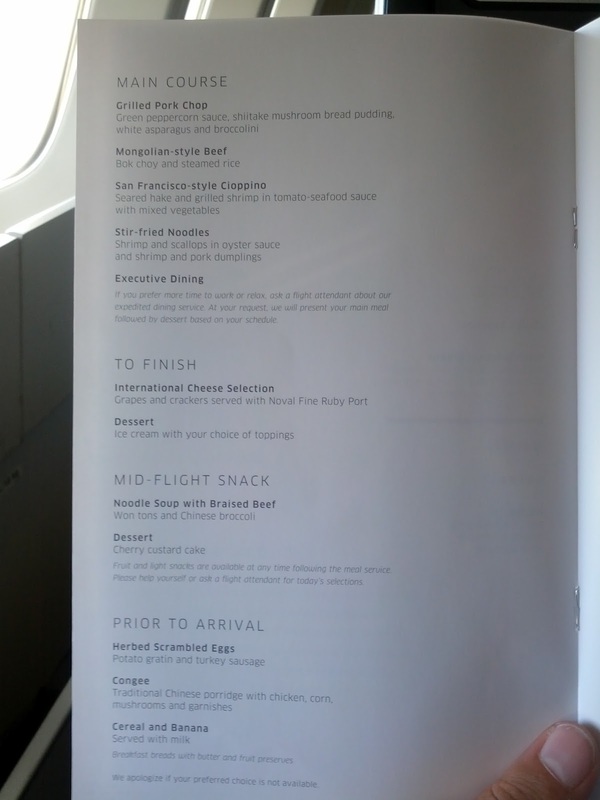 After eating, I watching a movie, got some work done, and next thing I knew we were getting ready to land in SFO. Since we had no in-flight wifi, I parked at the United Club to send and receive emails and get a little bit more work done before my flight to Shanghai. 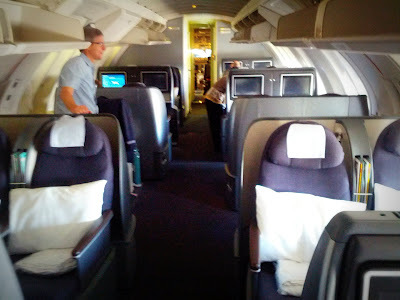 This flight had a number of first for me: first time flying a 747, first time flying in legacy United business class, and first time flying in a backward-facing seat. 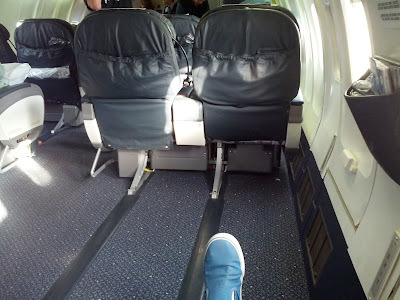 I was curious to try out the backward-facing seats, as I'd heard that some actually prefer them to forward-facing seats (since the plane is at a slight angle during flight, in a forward-facing seat your head is actually slightly below your feet when fully reclined). I was also curious to fly in the upper deck, given the smaller, more intimate feel. My backward-facing seat by the window - with bonus storage bins! 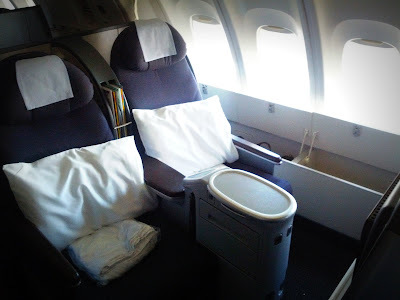 Comparing the legacy United setup to the legacy Continental setup, I prefer the Continental seat - I just found it to be a bit more spacious (though the upstairs seats on the 747 are supposed to be a tad shorter, so that might not be a fair comparison). I also didn't notice much of a difference in the backward-facing seat vs. all the other flights I've taken in forward-facing ones. That all said, I did find the legacy United entertainment system to be much better. The menu interface and controls were much more up to date and user-friendly. I hope it becomes the standard as United continues to integrate the fleet. Dinner was served soon after departure. I'd just had the pork chop on my flight to Germany, so decided to try the stir-fried noodles. Unfortunately, they didn't have any left, so I opted for the Mongolian-style Beef. 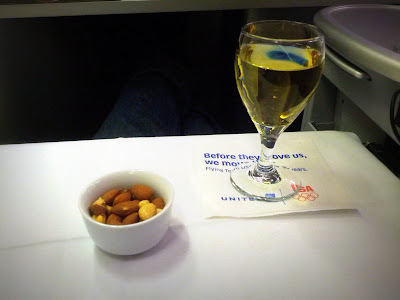 First things first though: warm nuts, and a glass of wine! I decided to try the chardonnay this time, and it was very pleasant. Why can't all meals start with warm nuts and a glass of wine? Next up, a chilled appetizer and salad. 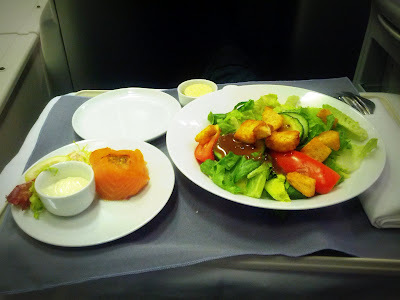 I generally find the appetizers on United flights to be pretty good - whether they're smoked salmon (as this one was) or some sort of shellfish. The salads though, have a lot of room for improvement. As it turned out, the Mongolian-style Beef was pretty disappointing. 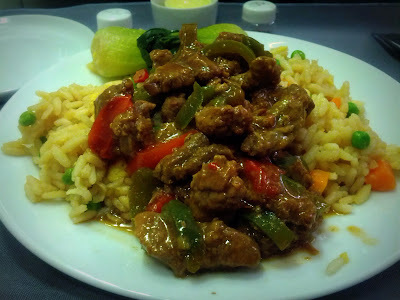 There wasn't actually much beef, and the rice on which it was served was gloppy and not particularly appetizing. 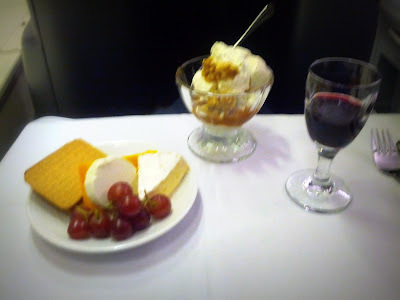 Nothing saves a mediocre meal like a cheese plate and an ice cream sundae though! Dairy products to the rescue! 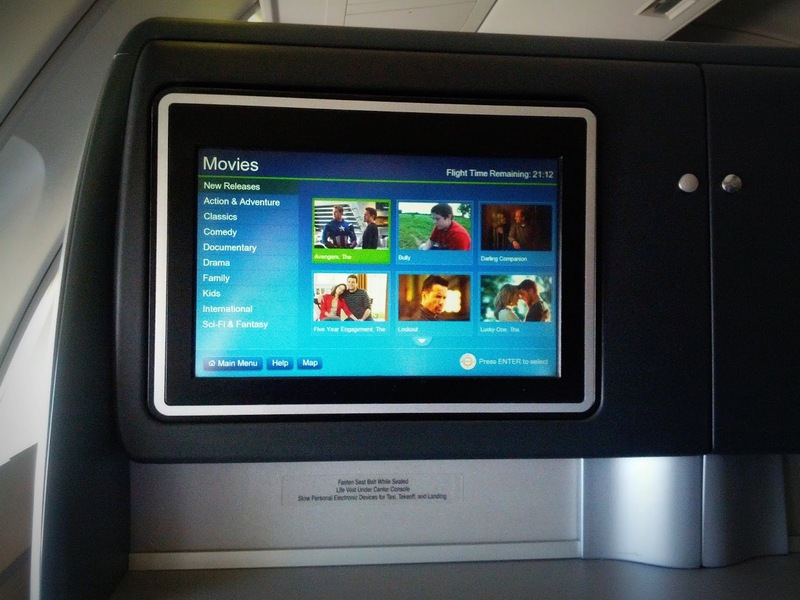 After dinner, I watched a couple movies and then passed out hard for much of the rest of the flight. 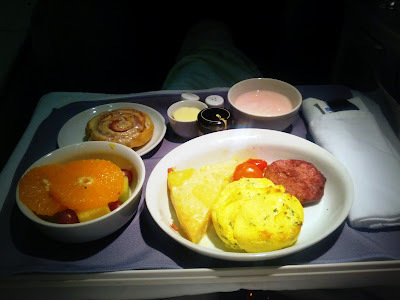 I slept through the mid-flight noodle bowl snack, but did wake up just in time for breakfast. 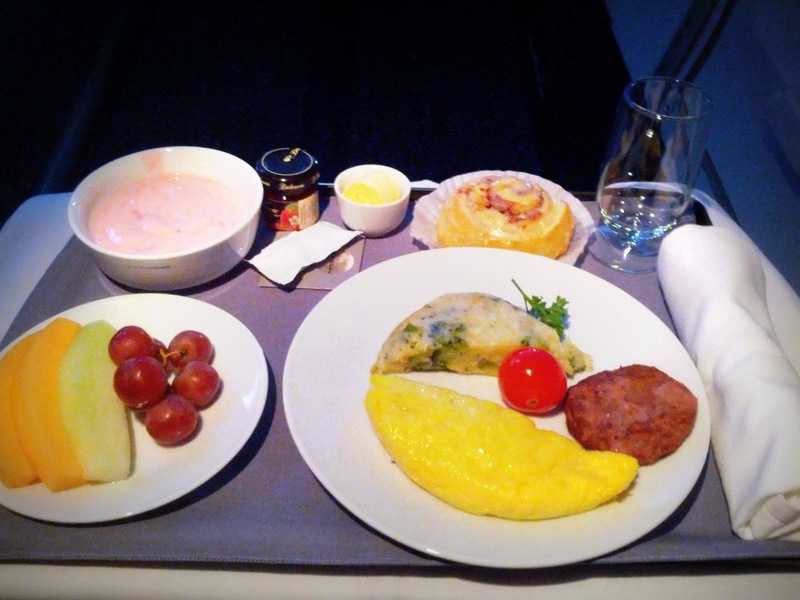 Two breakfasts in a single trip! We began our descent shortly after breakfast, and landed at Pudong airport around 5:30pm local time on Tuesday. I don't know that I'll ever get used to losing a whole day when flying to Asia. My flight from JFK to SFO took off around 8am Monday morning, and I landed in Shanghai around 5:30pm on Tuesday. Still find it hard to get my mind around that, despite having made the trip several times this year. After a quick pass through customs, it was off to the the taxi line and on my way to the Westin Bund Center.